We’d love your help. 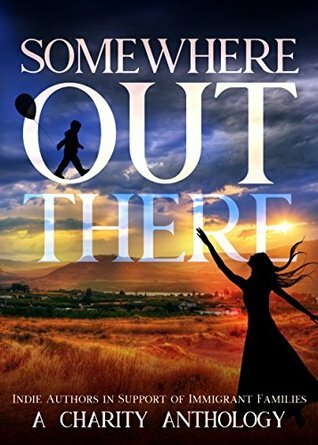 Let us know what’s wrong with this preview of Somewhere Out There by Margo Bond Collins. The stories included range from contemporary romance to urban fantasy to paranormal romance to horror to comedy, and beyond--they're as varied as the families and people whose dreams we want to support. The contributors come from all over the world, highlighting the international scope of this issue. To ask other readers questions about Somewhere Out There, please sign up. This amazing compendium written by over 150 indie authors, editors, artists and more who have united to raise awareness and more importantly, funds to help immigrant families with aid and other issues and give their support to immigrant children separated from their parents or families with no other means of surviving disasters of every imaginable type. *Fantasy & Fairy Tales -6 Pictures by S.J Davies; Queen of the Animals by Amir Lane and Mother of Gods by Skye MacKinnon. Vision of Secrets by Vincent Morrone. *Horror - This Bites! by Vincent Morrone & An October Dream by JoAnn Poster. *Contemporary Romance & Fiction - Secret Caress by Victoria Pinder, Caramel Surprise by Ja'Nese Dixon and Render Me Safe by Savannah Sloan. *Suspense/Thriller - Killer by Olivia Howe. *Sci-fi, Sci-fi Romance, Steampunk & Dystopian Fiction - Beyond the Northern Lights by Arizona Tape and Moonrise by Laura Greenwood. *Young Adult - 6 by Lindsey R Loucks & Wolf moon by J.M Taylor. *Creative Non-Fiction & Memoir - The Day We Ate the Sun by Mimi Milan. Many other excellent indie authors have also contributed, to make this an anthology no-one should miss - a) because it's a brilliant collection of fiction like no other, b) because it's outstanding value for money and c) most of all because it's a wonderful charity and it really needs your support! Click the link below to purchase the copy or read more about it! These amazing professionals have heart as well as talent. No other collection of stories could be more comprehensive or necessary. The writers of "Somewhere Out There" have incredible gifts and fresh ideas that can feel the struggles of immigration to band together and help the families. I enjoyed reading this book not only for what it stood for, but the stories were well written and absorbing. The Anthology “Somewhere Out There” was a very good read. My favorite story in the book was the excerpt “The Devil Doubles Down” by Judith Anderson. It was suspenseful, intriguing, and most of all, it concluded from the first book. Nice anthology for a good cause. Good place to find the prequel story to RA Steffan's The Horse Mistress quartet. New York Times and USA Today bestselling author Margo Bond Collins is addicted to coffee (mmm...caffeine) and SF/F television, especially Supernatural (mmm...Winchesters). She writes paranormal and contemporary romance, urban fantasy, and paranormal mystery. She lives in Texas with her daughter and several spoiled pets. Although she teaches college-level English courses online, writing fiction is New York Times and USA Today bestselling author Margo Bond Collins is addicted to coffee (mmm...caffeine) and SF/F television, especially Supernatural (mmm...Winchesters). She writes paranormal and contemporary romance, urban fantasy, and paranormal mystery. She lives in Texas with her daughter and several spoiled pets. Although she teaches college-level English courses online, writing fiction is her first love. She enjoys reading urban fantasy and paranormal fiction of any genre and spends most of her free time daydreaming about heroes, vampires, ghosts, werewolves, and the women who love (and sometimes fight) them.